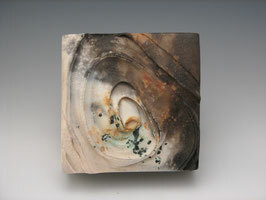 Delphic Landscape-Wall Tile - karinabromaitiss jimdo page! One of a kind, handcrafted wall tile. Hollow construction with a hanging panel with slot on the back. Approximately 5"x 5" x 2". Pit fired.